Rita Golden Gelman’s life changed drastically when, on the verge of divorce, she found herself in new and unchartered territory. This has lead to an exhilarating life on the road. 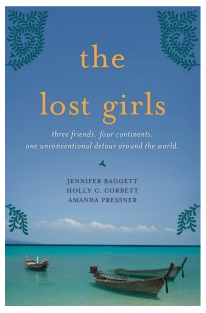 Her interests in anthropology have lead her to a nomadic lifestyle, integrating with cultures from around the world. Her experiences are amazing – I can’t even begin to imagine how she creates the amazing opportunities for herself that she has created. I guess when she said to herself…”There has be be more than one way to do life” – she really set her mind to exploring the possibilities! Only part way through and I am enthralled! While the book was an overnight sensation including movie with Julia Roberts, it has taken me this long to finally pick it up and read! I have been enthralled by the way Elizabeth Gilbert thinks, how she writes…I can relate to a hundred things she says, and I am not even finished yet! Reading Eat Pray Love has forced me to look at my life…what can I improve, what should stay the same and what would I do if I could let myself dream …. very fitting having just finished walking the Camino de Santiago where I hoped to answer some of those very questions. While I have yet to answer them….I realize that perhaps life’s many questions are not meant to be solved…only to continue to be explored while we are living it. I am enjoying this read immensely. While I have seen the movie, I will no doubt see it again when I finish the book…if nothing else, but to relive the moments in Rome, in India and in Indonesia! While I dream of walking the Camino de Santiago. Randall St Germain has lived it. 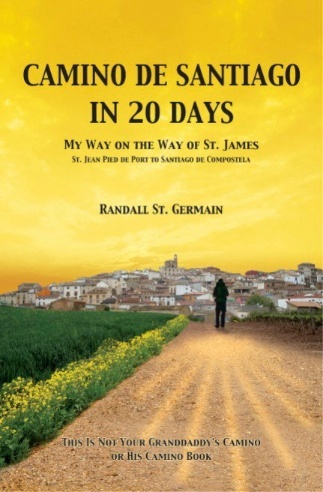 He shares his account of walking the Camino in 20 days. This is a matter-of-fact account of his day-to-day experience on the Camino. The good, the bad and the hardships. His objective – to complete the near 800 km from St. Jean Pied de Port, France, west to Santiago de Compostela, Spain in 20 days. He averaged walking 40 kms daily – a considerable achievement as he crossed the Pyrenees and battled with the weather, blisters and life on the road. While I plan to allow 40 days for my Camino, his account of the walk gives me a glimpse into what it is like to do this ancient pilgrimage. I am so lucky to have had the chance to walk the Camino. Tales and photos from the walk are found within the pages of my blog. A once in a life time opportunity – I will cherish it for years to come! Another one of those books, once you pick it up, it is hard to put down! While I dream of getting out and sailing in Australia’s Whitsundays, I have never done anything towards achieving this goal. Alayne’s tales of sailing around the world is so much more than a story of sailing – and this is where the appeal was for me. It was about the journey – the travel around the world and the deep personal exploration that happens on a voyage such as this. 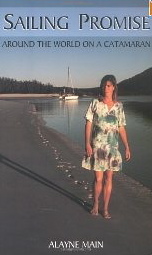 Her relationship with her husband, the tests thrown at them while out at sea and the personal development as they had to learn to cope together in conditions that would try and test the strongest of relationships! Her story is down to earth and very human. An inspirational journey that really proves that the journey is so much more than the destination. For more information – visit MainSailing. Awesome travel adventures of three friends who travel around the world. Love their writing style – almost felt like I was in the orphanage with them and I was so excited when their volunteer work took on such incredible meaning. I get lost in the pages and crazy tales of hostels, adventures and connections with people from around the world. I can hardly put the book down at night and have to resist the urge to pack in everything and go back out and indulge my wanderlust! Check out their page for more about their book….you won’t be disappointed. I read this book! I agree with you! I loved it! Read “Blue helmets and black markets”. It’s not a “happy” book, but it’s worth understanding the dark side of this beautiful part of Europe ánd the role of international politics. And to put things in historic perspective, “The Bridge on the Drina” by Ivo Andric (winner of the Nobel price for literature), is a múst, should you ever consider to visit Mostar and other parts of Bosnia-Herzegovina. You’ll still love Croatia ánd its neighbors, as much will stay unspoiled and ever beautiful, worth every step or mile you plan to explore. (And there are a couple more books I can recommend to make you come back to Croatia and neighboring countries). Keep filling that bucket, but don’t drown sipping from it ! I love the idea of books that inspire travel – you never know where your inspiration will come from next. I know a lot of people slammed the Eat Pray Love movie, but I thought it was great -the scenery alone was amazing!